What is the most common complaint about dentures? Answer: Lower Dentures. The fact is that all lower dentures have to operate in a highly mobile and active environment. Your lips and tongue will often unconsciously dislodge your lower denture. This can be a significant issue when you are trying to speak, chew, and swallow. Lower dentures that are loose and do not fit well can cause pain and soreness in your gums. In addition, traditional lower dentures can cause food to get trapped underneath it, resulting in unwanted problems or infections. How can Signature 28 help with your lower denture issues? Traditional lower dentures are fitted by pulling on the patient’s cheeks and lips to determine the proper edge/ border of the denture. 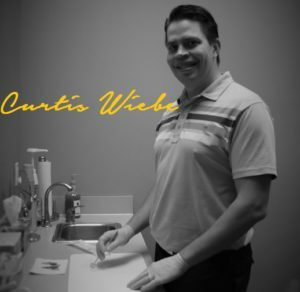 Signature 28’s Curtis Wiebe recently became an SEMCD certified denturist, and can provide our patients with a custom fitted lower denture. This lower denture has many wonderful advantages, including tremendous stability and improved suction. When you consult with Curtis, you will go through a series of sound tests and mouth movements. The process is longer than if you were to get a traditional lower denture, but the benefits are worth the thorough examination. When using the SEMCD technique, no two dentures are alike. Curtis will provide you with an amazing product that is unique to your specific mouth. Will this new lower denture work for everyone? Not everyone is a good candidate for an SEMCD denture. About 80% of the denture population could potentially be a good fit for this great product. There is absolutely no harm in getting a personal evaluation, and we encourage all of our patients to book an appointment at our clinic. What are the most significant advantages of this new lower denture? Your new suction denture is designed to work in perfect harmony with your jaw muscles. No more clicking sounds! Want to know more about suction dentures? Learn more about Dr. Abe, the inventor of the lower suction denture. Soothing Soups for your new denture or dental implants. 4 Signs you found the right Calgary Denture Professional.